WP Recipe Maker automatically includes all your recipe details in the recipe metadata. We use JSON-LD metadata, which is the format that Google recommends. This allows you to show up as rich snippets & rich cards in Google’s search results. No need to worry about this metadata either. Everything is added automatically behind the scenes when you write your recipes. It is also possible to mark recipes as non-food to not output the metadata. How can I test my recipe metadata? Our plugin only handles the "Recipe" portion of this. Your theme and SEO plugins like Yoast are responsible for the rest (and also very important!). You'll want to make sure there are definitely no errors in there. Warnings don't necessarily have to be a problem. Those are fields that Google recommends you to add, but might not make sense for all recipes (like a recipe video, for example). Another thing to look out for is that there is only 1 recipe item on the page. In the screenshot above it says "1 item" at the end, so that's what you're looking for. You should not have multiple recipe markups if you only have 1 recipe box on the page. If you do, make sure you don't have any other recipe or metadata plugins active. 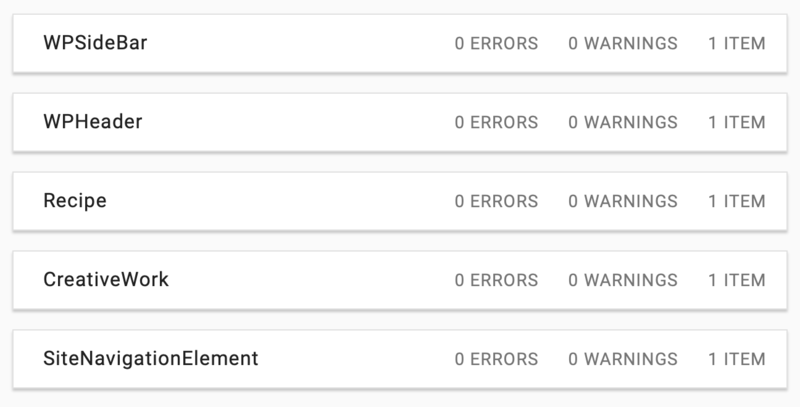 If you have multiple recipe boxes on a page you might want to consider marking some as being Non-Food recipes to not output their metadata and have only 1 recipe to focus on for Google. Another option is to use the setting on the WP Recipe Maker > Settings > Recipe Metadata page to only output metadata for the first recipe box on the page.